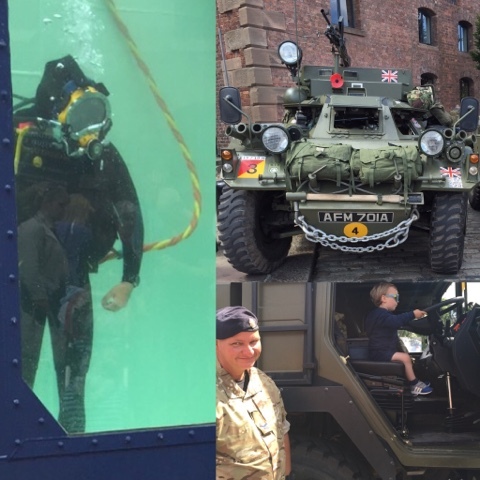 A children’s summer fete in the trendy Baltic quarter, Armed Forces Day at the iconic Albert Dock, and a pirate themed meal – a perfect Mum & Son date on a summer Saturday in Liverpool. 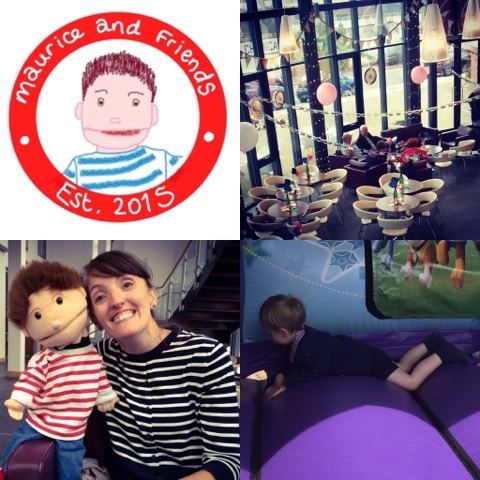 Maurice & Friends run friendly French playgroups for babies and toddlers set up by the lovely Barbara Tam with her eponymous sidekick Maurice the puppet in September 2015. “I was a teacher in secondary school for 12 years and absolutely loved it, but after having my little girl I wanted to do something that I could share with her too. I found Maurice the puppet in a charity shop last April and thought “voilà! That’s what I want to do!“. The groups combine songs, action rhymes, sensory play and some free-play with interactive and bilingual toys, and it helps develop language and social skills and run weekly sessions in Liverpool and the Wirral. No prior knowledge of French is necessary which is handy if you’re anything like me – I can just about manage the first two lines of Je Ne Regrette Rien in a pretty impressive – if nasal – impression of Edith Piaf. The summer fete was a lovely small event with messy play, music and crafts, baby massage and a bouncy castle. It was here I realised that it was the first time Primo had actually been on a bouncy castle and had absolutely no clue what to do. He survived by kind of crowd surfing over the heaving inflatable floor and somehow managing to dodge the impending little feet of other bouncers. I stood holding his shoes, trying to keep a straight face. He came out quite confused, dizzy, with half his clothes hanging off him and with Boris Johnson hair. Then promptly announced he wanted another go, of course. Siren, the ground floor cafe at 54 James Street, (home to the Women’s Organisation and a beautiful events venue and workspace in the rising Baltic district) had a lovely selection of food and drink for adults and children (carrot sticks, humous, pasta salad and a Perky Penguin for Primo, and a dirty great cheese and tomato toastie – which was out of this world – for me). Still keeping an eye on the weather and not expecting the best, I had planned to venture back to the fab Mattel Play nestled in the corner of the Albert Dock, so that Primo could enjoy the Thomas the Tank Engine and co themes there. But as we arrived I realised that it was Armed Forces Day so we spent our time outdoors meeting lovely men and women from the Navy, Army, and RAF. Earlier in the day there had been a service and parade in the city as part of the annual marking of Armed Forces Day which I’d have liked to have taken Primo to watch but I hadn’t put two and two together and didn’t realise anything was going on. Primo was mostly interested in anything with wheels – Land Rovers, all terrain vehicles, and big trucks. I had a go at paintball target practice and it turns out I am frighteningly good btw, so please don’t get on the wrong side of me – especially if you’re dressed as a black and white sketch of an advancing enemy solider. It was a bustly day, made even busier by some kind of children’s cheerleading tournament on at the Echo Arena, so there was Lycra and glitter and 8 year olds in American tan tights and full faces of make up everywhere, as well as the usual tourists who flock to the docks and extra visitors to Armed Forces Day. With all that going on, we were lucky to get a table without booking at The Smugglers Cove, a dark and cavernous rum bar and restaurant. The front of house staff were really helpful fitting us in with our friends in the late afternoon. I ordered some pork crackling and crispy calamari to nibble on while I sorted Primo out. The crackling wasn’t like my mum’s – it was probably more like pork scratchings so I eschewed that in favour of the squid with a nice piri piri salt and lemon mayo. We ordered burgers and chicken wings as well and there was plenty to go round and try a bit of everything and although we hadn’t ordered anything adventurous it all got the thumbs up in terms of taste, presentation and service. 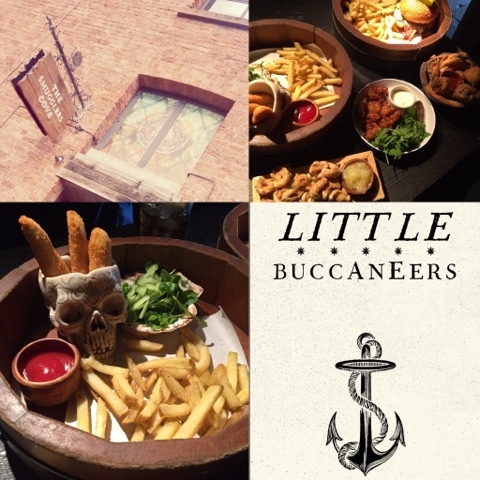 Kids get to choose from the Little Buccaneers menu which has the usual bangers and mash and fish and chips, as well as a mini deli board and chicken skewer to choose from which I think is a nice addition to the typical fare. For £6.95 they also get ice cream for dessert. The presentation was fab, served in barrel-style dishes with a large scallop shell for the side salad and even a skull for the chicken goujons. I would have loved coming here as a child as I was (and still kinda am) mad about pirates! For a day out like this I needed a couple of quid entry fee for the summer fete, roughly £15 for lunch at Siren (although could have taken a packed lunch and eaten on the picnic tables outside), parking at the Albert Dock (on street parking in Baltic area was free although a bit hit and miss), a donation to Help the Heroes for the paint balling, ice cream money and about £60 all in to feed four of us with soft drinks at The Smugglers Cove. Not the cheapest day out perhaps, but Primo’s 12 hour uninterrupted sleep that night was priceless. I so wish I'd known about Smugglers Cove a week ago! Im from liverpool but don't live there now, we visited for 10 days a week back and spent so much time at the docks (Mattel Play…) – my eldest LOVES pirates and would just love it there! Next time!!! Oh no! If only I'd been more organised and posted this sooner! Check it out next time. 10 year old me would have wanted my tea there every night! Have you seen the pirate ship made of wood on the beach at New Brighton? It's small but good for climbing on.